Magmaman: (Laughs) Ye gads, that’s the best joke I heard all night! It sure takes the sting out of Crorq bumping down to crossing duty all week. Galaxyman: (Long, awkward pause) What did you do this time? Magmaman: It’s a long sordid story that-- (Hears a skittering in the vents above) Did you hear that? Magmaman: Sizzling Circuits, what the heck is that? Fox: (Grins even wider) Hi. Magmaman: (Stares incredulously) I rephrase that question: what the hell are you?! Magmaman: Grr. You’re under arrest for trespass-- (The fox curls up and executes a maneuver similar to a spin dash, expect enveloped by flames, jumps, and bonks him on the head before speeding down the hall) Hey! Get back here you runt! Galaxyman: (Over the internal radio) This is Officer Galaxyman, we have an intruder in Section D! Be on the lookout for a fox kid-- thing. Fox: (Coughs, and then perfectly mimics the officer’s voice) He’s in Section B, and ripping out panels from the mainframe! Fox: (Smirks) This is too easy… and fun! Magmaman: Nothing! Where did the furball go?! Galaxyman: All right furball, come out with your paws up! (Hears a ticking noise) What the? Geminiman: (Sees Magmaman’s outline) Tch. What a mess and they say this is the handiwork of last night’s intruder? Shadowman: That’s what they say. He appeared out of nowhere and disappeared just as quickly. Geminiman: My intuition tells me that a supernatural presence was here last night. Hardman: Did you get that by looking in your crystal ball? Geminiman: No, just the way the intruder bypassed the motion and thermal sensors in the vents to say nothing of his brazen disregard for the Sentinel’s abilities. You doubt my powers of deduction, Ben? Hardman: (Pause) You really want ME to answer that question? Shadowman: ANYWAY, Crorq called us in. He will brief us on the situation. Snakeman: And by “brief” you mean give us the bare minimum of relevant information and send us on a mission to capture the intruder. Spark Chan: Look on the bright side. Maybe he will be in a better mood today. Crorq: (Still has five pounds of beans dripping from his mouth) Ah, greetings my lowly subordinates. I trust your journey was pleasant. Crorq: Did you actually think I give a care for squalid and insignificant existences? Crorq: I mean, how can you even hope to achieve the level of perfection I embody? Hardman: Will you get to the fraking point already?! Crorq: (Pause) Magnetman will you kindly restrain your teammate? I fear the stress is too much on his core. Hardman: Oh, you sonuva-- (Feels the magnetic field warp his insides) OW! Magnetman: You heard the man, Hard. Time to “ease up” a bit. Crorq: Ahem, as I was about to say before some nameless INFEDEL interrupted, I called you here because of a serious breach in security. Shadowman: That’s what you screamed at us about on videophone for fifteen minutes. Snakeman: This is pretty serious, RPD headquarter is one of the most secure buildings in the entire city. No one can just waltz in here without anyone detecting them. Crorq: How astute, for a robot with the processing power of a pocket calculator. Shakeman! Use your infernal appendage to play the footage of our unwanted guest! Shakeman: As you wish sir. Magnetman: Somethin’ wrong, Boss? Looks like you saw a ghost. Shadowman: You can say that (to Needlegal) remember that adventure we had with the Sinister Six and the X-Force many years back? Shadowman: That’s the one. Do you remember it, Ben? Geminiman: I remember that misadventure as well. What about it? Shadowman: That fox, he reminds me of the one that showed up on the Six’s doorstep and demanded they hand over whoever was responsible for the disappearance of the X-Force. He disappeared shortly after that and no one has ever seen him since. Topman: That sounds like a rather convoluted tale. I must have blocked it from my own memory. Crorq: Indeed. My superior processors overclocked themselves to comprehend your nonsense to no avail. I demand more clarification! Shadowman: Only Ben can give that to us. Who was that fox and why did he demand to know what happened to the X-Force? Hardman: The hell if I know. Maniacs: (Long, awkward pause) What?! Geminiman: It was YOUR team and YOUR history. How can you not remember? Crorq: Yes, YES! Explain yourself immediately! Hardman: I died, came back, and switched identities so many times I lost track. I was even Blaze Heatnix for two weeks for Chrissakes! Crorq: Enough of this useless exposition! I want you locate this impudent trespasser and bring him back for interrogation! Snakeman: That’s it? You want us to play animal control officer? I mean, he did break into our headquarters and led our “sterling” comrades on a foxhunt but why did he break in the first place, why was he in the central surveillance hub? Crorq: That information his highly classified, besides, you work for me and I don’t pay you to ask questions. On that subject, due to budgetary cutbacks you will are all required to take a ten percent pay cut. Crorq: (Stomps his feet and randomly fires his blaster, narrowly missing Shakeman and hits the screen) Are your aural sensors defective?! I gave you an order, INFIDELS! Now get out of my sight! Shadowman: (Sigh) Let's go team. We have a fox to catch. Crorq: Silence! That file contains sensitive information I don't want falling into those cretins' hands. Besides, that hardly matters. Hardman is clearly lying since he was in that fox form when we retrieved his worthless husk from space! He is using it to undermine my authority! Shakeman: B-B-But he has an alibi, sir. Your spy cameras have footage of him at the Autobar last night. Crorq: Well, what are you waiting for, infidel? Show it to me immediately! Shakeman: I would but (points to the destroyed screen, which is belching out sparks and smoke) you blasted the screen during your last outburst. Crorq: Then find me another one and return with another thirty-pound burrito while you are at it. Make sure it has "Chernobyl Meltdown Sauce" this time! Then comes my one o' clock sponge bath! Snakeman: (Over his internal radio) Snakeman reporting no signs of any intruders. Hey, I thought the city was going to demolish the (original) Sinister Six's headquarters so this park could expand. Shadowman: (Sticking to the shadows near Frost Mountain) They were, but a new owner showed up and halted it. Don't know who it is though. Are you sure the fox will show up? Why this place? Snakeman: I did some research after Crorq briefed us and found some strange reports of a fox-like creature trespassing on park property after hours from the security here over the past three weeks. He's liable to show up again. Geminiman: (Patrolling Toy Town) I did some research as well and came to the conclusion that the fox is in fact a kitsune. Needlegal: (Outside Swordman's Temple of Doom ride) A what? Mind explaining that to the rest of us plebs? Geminiman: A fox-spirit with incredible magic power, Needlegal. From what I gathered, they feed off of raw energy so all we need to do is set a few traps and use E-Tanks as bait for our errant vulpine. Needlegal: Why do I get the feeling your plan is doomed to failure? Topman: It definitely sounds like something out of an old Warner Bros. cartoon. It's bad enough we let Magmaman and Galaxyman come along. Spark Chan: Well, the fox did humiliate them and I believe in second chances. Topman: Yeah, but he'll probably outFOX them again. What do you think, Ben? Hardman: Probably. Those nimrods couldn't catch a cold. Hardman: Do you ever get tired of correcting people? Topman: It's just a habit of mine. Hardman: Well it's gettin' on my nerves. I'm going to nose around Tenguman's Sky Ride, don't wait up. Needlegal: Wait, Ben! (Too late, Hard meanders off and ignores her.) Geez, what is up with him? Topman: How rude, is it me or is he more cantankerous than usual? Needlegal: Ben was never Mr. Congeniality in the first place. Was he like this on the X-Force, Classi? Spark Chan: Um, I don't think it would be appropriate for me to say. You two go on ahead, I'll go find Ben and keep an eye on him. Shadowman: What about you, Sheriff? Magnetman: (Setting up a tripwire in Searchman's Jungle Adventure) Almost done with my trap. If the critter pokes his nose in here, he'll be in for quite a shock. Voice: (Snickers from behind him) He won't know what hit him. Magnetman: I know...wait a minute. (Turns his head to see...the fox) YOU! Magnetman: (Pulls his revolvers from their holsters and aims them at the fox) How did you...? Fox: (Wags his finger and winks) That would be telling. Magnetman: Doesn't matter one way or the other. You're coming with me. Fox: Oooh! You like the play cowboy? Issat a real gun? Magnetman: Don't just stand there you idiot! Help me down! Fox: (Smiles, and heads for the exit) Thanks! Magnetman: Why that useless hunka-- (Fires his revolver twice to snap the cable, and lands less-than-gracefully on Magmaman) This is Sheriff Magnetman! The fox showed up and it's headed westward. Snakeman: Confirm that. He's headed towards the Hall of Mirrors. Geminiman: On my way there already. Geminiman: Come on out with your paws up. You might have gotten the best of the Sheriff but there are still seven of us left. Why not make it easier on yourself? Fox: (His voice echoes from some unknown direction) Where's the fun in that, Pointy? Geminiman: (Looks at his distorted reflections and cringes at the name, "Pointy") This is not supposed to be "fun." Geminiman: Your little game is starting to bore me. I know what you are! Fox: You have NO idea what I am. Geminiman: Then why don't you come out so we can get better acquainted? Fox: Not "Ack!" It's Pyro. Pyro Da Fox. Needlegal: (Via the internal radio) Let me guess, Lennon. Fox-boy got away? Geminiman: Oh, be quiet. He was far more clever than I anticipated. (He uses his Laser to cut through the net) Snakeman! Can't you simply tranquilize him from your vantage point?! Snakeman: Gah! No, he's moving too fast for me to get a bead on but he's heading due north for the train. Pyro: (Snickers) This is too much fun and almost too easy. Shadowman: I'm glad that makes one of us, but playtime's over, kid. Pyro: (Spins around) Says you! Shadowman: You know, we don't get to do the whole 'guest star' thing anymore. Why not just toddle back to the Sonic universe where you belong? I think the bus to there leaves in an hour. Pyro: (Snorts) But you guys are too much fun. ‘sides, who said anything about the Sonicverse? Pyro: ‘Twas a hologram? Now that's getting a little old hat, isn't it? Shadowman: What can I say? It's a classic! Pyro: But cheaper than an SNK Boss-- (Summons a vortex of white-hot flames to dissipate them) BLAZING SPIN! Shadowman: Heh. Was worth a shot, wasn't it? Pyro: (Does a back flip over the lone Shadowman as he throws two more Shadow Blades) You're fun. I like you. Shadowman: I wish I could say the feeling was mutual. Galaxyman: (Swoops in unexpectedly) Hey furball! Shadowman: (Facepalms) Oh, not now. Pyro: (Lands on top of his head and grabs on to the antennae) Yee-haw! Ride ‘em! Shadowman: Ugh. Remind me never to let those two tag along on our missions. Ever. Pyro: Look Ma! No hands! (Looks to the audience) and don't try this at home, kids! Galaxyman: (...) Who are you talking to? Galaxyman: What are you talking--? Pyro: (Blows kisses as he lands on a nearby corn dog stand.) Cya, and give my regards to the Air Force! Yeow! Needlegal: That was a warning shot, Fox-boy. Or do you want to continue this dance? Pyro: Hey! No fair double-teaming up on me like that! Spark Chan: (Dashes in) Sorry, I'm late. Needlegal: (Notices Hardman is missing) About time, did you find Ben? Spark Chan: (Shakes head) I lost him shortly after we split off, then the fox suddenly appeared so I came to rejoin you as fast as I could. Needlegal: (Curses under her breath) Hmm. In any case prepare to stun Fox-boy with a Spark Shot while I keep him on his toes. I'm sure Ben will show up, some time. Topman: (Notices the scorch mark on his boot) Yee-ouch! That's some hot stuff! Pyro: You like me! You really like me! (Goes doe-eyed at he jumps away from Needlegal's attacks.) ACK! Topman: So that's it? I admit I'm kind of disappointed. Needlegal: Speak for yourself. Chasing a bratty fox around an amusement park is not my idea of a good time. Spark Chan: (Retracts her electrodes) I will just see if he's all right, if no one minds. Topman and Needlegal: What the?! Geminiman: I don't think so. Magnetman: (Spins one revolver while he holsters the other.) Don't get cute with me, kid. Shadowman: It's over, kid. Just surrender and we can all go home. Except you, of course. Magnetman: Though I hate using my power this way, I'm making a once-in-a-lifetime exception for you-- ya mangy fleabag! Pyro: Hey! (Grabs the bars and vainly tries to pry them apart) No fair! Magnetman: (Spins his revolver and holsters it.) All's fair in love and war, runt. (Reaches in to grab him by the bandana, and pulls out a disk) Pity about this disk though, my magnetic field just erased it. Needlegal: And what's so funny? Snakeman: This was all a game to you? Topman: Breaking into RPD HQ, stealing that disk, and having us chase you around. You call that a GAME? Pyro: (Grin grows wider) Duh! What else would it be? Geminiman: I believe someone needs a new definition of fun. Pyro: I call it my "NOVA SPHERE!" and it actually packs a punch. Wanna see? Shadowman: Damn it! He got away. Needlegal: Enough! At least the disk Fox-boy stole is now useless thanks to the Sheriff. Hopefully that will satisfy Crorq. Magnetman: (Tips his hat, and winks back at her) Much obliged, ma'am. Hardman: (FINALLY arrives on the scene.) Damn it, I missed the whole thing! Spark Chan: (Turns around) Ben! Geminiman: And what took you so long to show up? Geminiman: And there he is ladies and gentlebots! "Gentle Ben." Hardman: (Lunges at him, but Sparkchan stops him) You little sonuva! Spark Chan: Ben-sama, please! We don't need any more violence tonight. Snakeman: Agreed, we got at least some of what we came for. We'll worry about the fox if he sticks his nose out again. I just don't look forward to meeting with Crorq tomorrow. Crorq: Why must I surround myself with IDIOTS? What is so hard about capturing one insignificant gnat?! Crorq: SILENCE! You failed me not once but TWICE. For both your incompetence, I am demoting BOTH of you to my personal cleaning detail! Crorq: Now get to work. I finished two feasts of the Colonel's finest and my innards won't clean themselves! Crorq: And you! Your incompetence is just as damning. You nearly capture that troublesome vulpine and he escapes using a parlor trick? Snakeman: To be fair, sir, we had no idea of the scope of his powers. Crorq: And you say that like it's the perfect excuse. Shadowman: The mission wasn't a total loss. (Shows Crorq the now-erased disk) Exposure to the Sheriff's magnetic field erased the disk so the fox can't use it anymore. Magnetman: So you can look at it this way, Boss. We don't have the fleabag in custody anymore but he doesn't have anything to hang over your head. Crorq: (Greedily swipes the disk from Shadowman's grip) Excellent! I suppose you accomplished SOMETHING useful. Well since I am feeling rather magnanimous this morning, I will overlook your failure this ONE time. Crorq: There is one thing, though. Where was Hardman when you engaged the vulpine? Spark Chan: I was following him when it happened, sir. Crorq: And did you see him afterwards? Crorq: (The emoticon on his screen indicates inquisitiveness) Curious. You are dismissed. Geminiman: (Whispers so not to arouse Ben's attention) I thought you said you lost Hardman after he split off. Why did you change your story? Spark Chan: I have my reasons, Lennon, and I would rather not talk about this case. Snakeman: Same here, I think I had my share of woodland creatures for the next few weeks. Needlegal: And we learned something too. 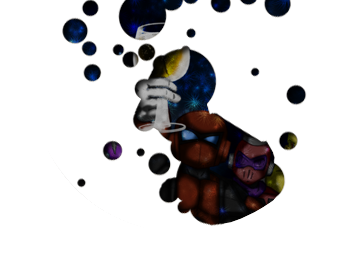 Magnetman: Huh? Learned something from this blasted mess? Needlegal: Yeah, sometimes the past comes back to bite you in unexpected ways. An obscure character from an adventure half of us can barely remember returns to put us all through the ringer because he wanted to play a game. I mean, what kind of character shows up from oblivion to do that? Snakeman: Someone with a long memory? Needlegal: You mean from accounting? But who in that department hates us? Shadowman: Probably the bureaucrat who sees how much money we spend on Lennon's polishing. Topman: Well, until Lennon buys generic brand, we are... The Mechanical Maniacs! (Looks around) Hey, did anyone see Ben? Hardman: Erik, Britt, Rich, Leon--and Gary. You are all missed.